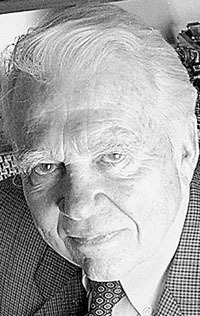 Andy Rooney was the gray-haired, enormous-eyebrowed fussbudget who complained about things for a few minutes at the end of the top-rated 60 Minutes every week. For decades, he offered viewers his opinions on his neckties, the old keys on his key ring, the clutter about his desk. He provided the show's closing segment from 1978 until mere weeks before his death in 2011, and also wrote a twice-weekly syndicated newspaper column. Rooney began his career as a writer for Stars & Stripes while in the Army during World War II. He later wrote for Arthur Godfrey and His Friends and The Garry Moore Show. He wrote for CBS's The Morning Show in the mid-1950s, when it was hosted by Will Rogers, Jr. He began writing CBS News "essays" in the 1960s, beginning with "An Essay on Doors" in 1964. He won an Emmy for writing the 1968 CBS News special Black History: Lost, Stolen or Strayed. Younger and more impatient audiences found Rooney's meanderings quaint, tedious, or unintentionally amusing, and he wasted an inordinate amount of network air time discussing such things as shoelaces, salad dressing, and how difficult it is to crack nuts with a nutcracker. Rooney did, however, occasionally have something to say, and when he did, he said it well. "Which weed has killed more people over the years?" Rooney asked in 1998, "tobacco or marijuana? No contest, tobacco has. Marijuana and cocaine are bad for people so they're illegal. Why isn't tobacco illegal?" "I heard from God just the other night," Rooney reported in 2004. "God always seems to call at night. 'Andrew,' God said to me -- he always calls me Andrew. I like that -- 'Andrew, you have the eyes and ears of a lot of people. I wish you'd tell your viewers that both Pat Robertson and Mel Gibson strike Me as wackos."